For the last several months, I’ve been sharing all sorts of goodies from the Occasions Catalog and the Sale-abration Catalog, but I’ve sadly been neglecting the Annual Catalog & Idea Book. There is so much good stuff in there and I haven’t been sharing it with you! Can you forgive me? I need to fix this right now because the current Annual Catalog will end 5/31 and the new one will start 6/1. When the current Catalog came out last year, one of my must-purchase sets was Watercolor Wings and the coordinating Bold Butterfly Framelits die set. Sadly, it’s been sitting on a shelf collecting dust for months. Sometimes my stamps don’t get enough use because there’s always something new and fabulous coming out. Now that Spring is quickly approaching, this set was screaming to be used. This stamp set is a two-step stamping process. 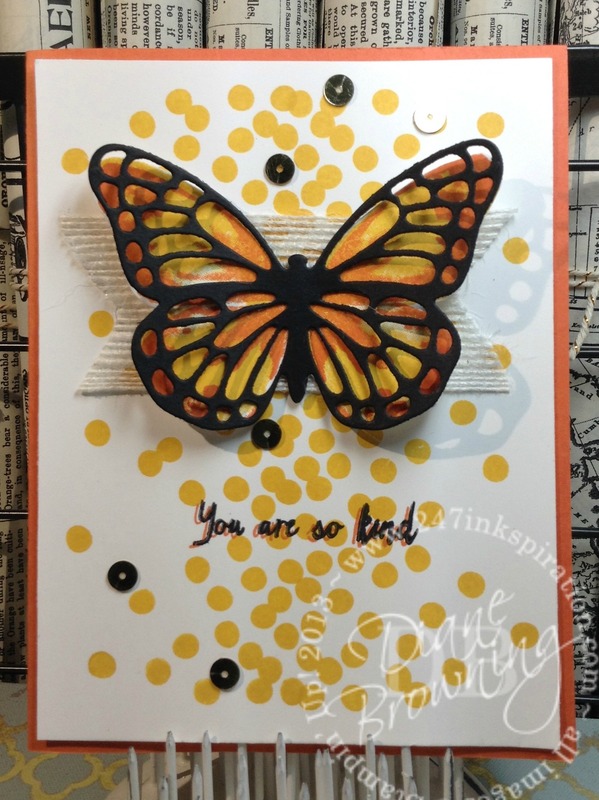 I stamped the butterfly wing base first in Crushed Curry and then the second stamp is the wing highlights in Tangerine Tango. The die cut lays over the top of the stamped image to complete the look. I love the vibrant colors of Monarch Butterflies, so that’s what I was going for here. The polka dot background was created using the Dotty Angles stamp set. The catalog shows the stamp horizontal. I stamped it vertically to give it a different look. It’s stamped back to back to and I didn’t worry about overlaying the dots. The sentiment was stamped first in Tangerine Tango and then slightly offset in Basic Black. The Tangerine behind the Black gives it a little bit of shadow and ties it all together. The White Jute Ribbon was hand cut. I think it helps set the butterfly off on the front of the card. For the gold sequins, I just pulled a few off the roll of sequin trim and adhered them using my Fine Tip Glue Pen. Sale-abration is still going on for just another couple weeks and yes, you do earn Sale-abration benefits on purchases made from the Annual Catalog as well. For every $50 (pre-tax and shipping) you earn one free item from the Sale-abration Catalog. There’s some cool stuff in there. Don’t miss out because once Sale-abration ends, those products are no longer available. I’ll be sharing more stamp sets from the Annual Catalog as we start to transition to the new Catalog in just a couple months. 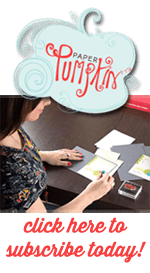 Every year, Stampin Up retires a selection of stamp sets, along with other products (paper, inks, embellishments) in the Catalog. I’ll make sure to relay that information to you as soon as I have it because it’s always “while supplies last”.